You have no idea how difficult reviewing this album has been for me. First of all it was relatively late in the day when I received my copy from the record company, meaning reviews were already on the Internet from people I know, trust and admire. But if I read their thoughts before hearing the music myself, would it colour my judgement? It was a dilemma; but I somehow resisted the temptation. Then there was dilemma #2; how could I possibly write about Something More Than Free without referencing Southeastern from 2013; which was a ‘game changer’ for the ex Drive-By Trucker. In fact should I do a compare and contrast? Well I’m forgetting about all that nonsense and simply giving you the low-down on the actual album itself; warts* and all. So; it was with some trepidation that I pressed ‘play’ on the CD player…..phew; the opening bars are absolutely delightful, fun and If It Takes a Lifetime will make you want to kick off your shoes, sit back and sip on your favourite beverage be that beer or a Margarita for the next hour; even if that first song is about a man with drink problem! What follows are is a wonderful series of short stories set to music where Isbell surpasses himself; inhabiting the characters and living their lives for them and us, the listener. The electric guitar on Palmetto Rose is so dirty at times I’m sure it will be illegal in at least for Southern States. Slow and slightly Gothic the song will probably go onto be a contender for Alt. Country ‘song of the year’ if such a thing exists. As a sucker for a love song; Isbell’s 24 Frames had me from the get-go and the chorus is spectacularly special – I won’t give anything away; seek it out. Again; the band and especially Isbell’s guitar playing is exceptional. On Flagship Isbell’s writing is so clever it took me several listens and a scan of the lyric sheet to find the love song is actually not just a couple looking back on their life but the actual hotel where they met and continued to visit. I’m not sure if Jason Isbell’s voice has ever sounded better than on this album; especially on the title track which also has Amanda stealing the show with some simple, but beautiful violin playing in the background. Oh dear; I’ve nearly forgot about another track that ‘jumped out at me’ when I first listened and is still in my head when the disc is back in the case; Hudson Commodore. The production gives more than a passing nod to the Band (Cahoots era) as does the singer’s voice, which occasionally reminded me of Garth Hudson’s. Halfway through the album, coming in just shy of six minutes we get the longest and most personal song of the 11 tracks here. Children of Children is relatively stark, with intimate detail after intimate detail of a torrid life seeping from your speakers as Isbell drags the notes out of his guitar as Amanda Shires haunting fiddle playing creates a dark shadow behind him. The song ends with a string section sweeping in and out like an all-encompassing fog. I’m not sure he’s released a better song in his career. 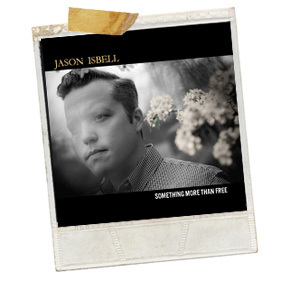 Well, there you have it, Something More Than Free is a slow burner and a ‘gift that keeps on giving,’ with each story slightly unravelling every time you hear it and Isbell’s band are on fire throughout. Take your time when you buy this album; don’t jump to conclusions too quickly; this is like a really fine and expensive malt whisky that needs to be cherished and savoured. I was only kidding about the warts* – there aren’t any.